Toque & Canoe checks out Authentic Indigenous — a program that gives consumers a direct line to certified aboriginal artists. Some of the most meaningful souvenirs I’ve collected as a traveller in Canada have come from First Nations artists. A small chunk of caribou antler carved into a face with gemstone eyes. A beaded business-card pouch made from sweet-smelling smoked moose hide. An argillite bear pendant created by Haida Gwaii carver Amy Edgars. So it’s with great interest that I’ve recently learned of an initiative called Authentic Indigenous — a program designed to give those with an interest in First Nations culture a direct line to the artists themselves and to the legitimate outlets who front them. If you ask Brenda Baptiste, interim CEO of Aboriginal Tourism BC (which helped launch Authentic Indigenous) she’ll tell you that throughout history First Nations artists have been systematically exploited. “Many have not been fairly compensated. Some have had their designs stolen and mass produced overseas. Overall, they’ve had very little control,” Baptiste tells me. Internationally acclaimed Coast Salish artist and program founder Shain Jackson (see his work above) has overseen the initiative since it launched in 2014. The owner of Spirit Works Limited says the program — which has a mandate of “speaking truth, protecting cultures and providing for people” — has vetted over 200 members for Authentic Indigenous certification to date. Jackson says his interest in the initiative comes naturally given that decades ago his grandmother Mary Jane Jackson — a member of the Sechelt Nation — used to make cedar-root baskets and sell them for a song to support her family. “Her story speaks to everything the program is about. This woman would get up with the sun and head to the mountains to dig roots with a stick. She would never stop. She’d split the roots with her thumb nails. I can still see her hands — beaten, bloodied and bruised,” says Jackson, who calls his late “Granny” his source of artistic inspiration. 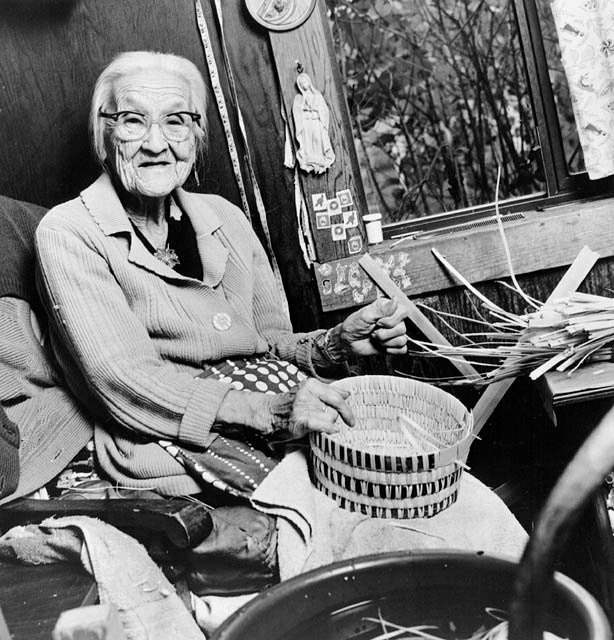 He says she’d sit outside the local general store, weaving “incredible” baskets and selling them for a sack of flour to help feed the 10 to 15 children she sometimes watched over. —Tier 1: When a First Nations artist, or an artist with an indigenous company, designs, produces, and distributes a piece of artwork. —Tier 2: When an indigenous art product is designed by an indigenous person and distributed by an indigenous person or business, but made by others outside the indigenous community. —Tier 3: These products bear the artwork of an indigenous artist who’s been fairly compensated for their work and has also approved the final design. The producer and/or distributor need not be indigenous. Recently, my brother gave me a striking hand-pulled silkscreen print for my birthday created by Tsimphian/Norweigan artist Bill Helin. The piece, “Journey of the Ravensong,” is the lead art for this post. Turns out my mom, who grew up on the Northwest Coast, went to school with Helin’s mom (small world!). It also turns out that Helin is part of the Authentic Indigenous program. This initiative, Helin tells me, is important and it will be successful “if it stays simple and focused on its original spirit and intention. It needs to remain grounded in the artist as it grows.” He also hopes further measures will be taken to educate indigenous artists about how to become successful entrepreneurs. It makes sense that Authentic Indigenous encourages direct contact between artists and those who appreciate their work. When we speak in person, it makes the exchange richer for everyone involved. Our common humanity becomes part of the equation. Case in point? During research for this story, I spoke with program member Joni Olsen, a textile artist with the family-run business Salish Fusion Knitwear. You can bet that when I travel to Vancouver Island, I’m going to track Olsen down. I’m dying to know more about this unique tradition. Meanwhile, check out this fine-looking toque by Salish Fushion Knitwear. I don’t know about you, but my order is in. Note from Editor: This post is part of a series Toque & Canoe is producing in an arms length collaboration with Aboriginal Tourism BC (AtBC). Check out AtBC’s own listing of First Nations Arts & Culture in British Columbia if you’re interested in learning more. For other stories in this series, see Powwow Power: The Colours of Kamloopa, A Celebration of Living Culture and Tasting Turtle Island: Aboriginal cuisine goes mainstream This story was not reviewed or edited by our partners before publication. One of my most memorable visits to the toque and canoe site. 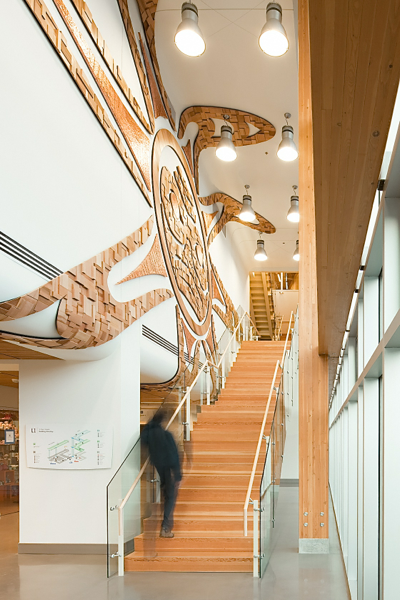 The mural on the staircase is one of the most breathtaking examples of indigenous art I’ve ever seen.